Use your face moisturiser around your eyes as well as on the rest of your face. Sunscreen is always the most important item, but for warm-weather destinations, the amount you will need for your body will take up way too much space in your luggage. That means it’s best to buy those products when you get to where you’re going, or ship your favourites to your destination before you leave so they’re ready and waiting for you! Our facial sunscreens are the perfect size for your carry on, as is our RESIST Anti-Aging Lip Gloss. 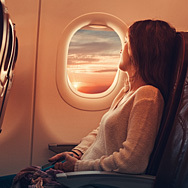 Be sure to reapply sunscreen after a long-haul flight that arrives during the day. Cleansers are one of the few products you can transfer into any travel-size container because the ingredients are stable whether exposed to air or not. For an even more convenient option, makeup remover wipes are handy for the plane and travel in general. Bonus: They're great for your carry-on luggage. Scrubs, cleansing brushes, or other cleansing devices can stay at home; a soft washcloth with your face cleanser works perfectly.